the discovery is a wonderful range of parts and patterns. almost every corner lends itself to parallelograms from tapered streets, repetitive stripes from fencing or gates, and lines with knots from electrical wires above. 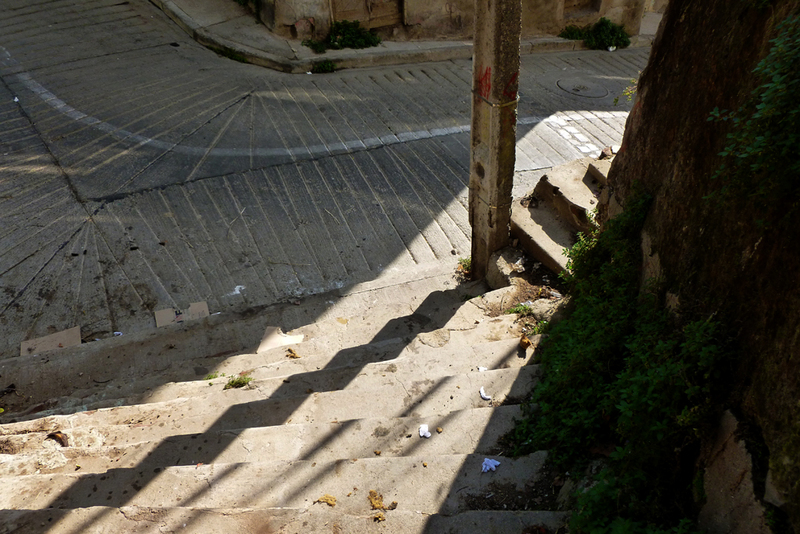 in a city where the streets are labyrinths and the topography is varying, sunlight is a valuable indicator to suggest that the seemingly closed pathway in front of you is in fact a connected route. light of varying edges also speaks to an architecture of components and spaces of complexity. with narrow streets, in comparison to lubbock, texas, these sun-striked pathways with greatly changing shadows are not just theatrical but also performative. since the sun only enters a portion of the city streets, particular areas become concentration destinations depending on the need to warm the body or cool the body. This entry was posted in chile, light, valpariso and tagged narrow streets by vmcreynolds. Bookmark the permalink.